On October 30th Shihan Cunningham and I were to make their third pilgrimage to Okinawa this year. This time our group also consisted of Shihan Cunningham’s wife Kirsti, and their young daughter Amelia, along with Allan Engelin 4th Dan, Ian Holdaway 2nd Dan, and Mark McFadden 1st Dan. We arrived at Kansai airport on Thursday evening 30th October, checked into our hotel and spent the evening checking a huge shopping outlet, a fun park for Amelia, a meal, and to bed. The next day we left early for Nara….this was the original capital of Japan before Kyoto, before Tokyo, so the amount of history there is truly amazing. There are many old and amazing temples and pagodas, the most impressive of which was Todaiji Temple which is home to Daibutsu, the largest Buddha in all of Japan. Todaiji is the largest wooden building in the world and dates back to 8th century. It was back to Kansai on the Saturday evening and on the plane to Naha on Sunday morning. On arrival in Naha we checked into our usual hotel, the Nahana, which is now beginning to feel like a second home, contacted Hokama Sensei, and arranged to meet him for dinner with two of his senior students, Taira san and Seki san. We spent a pleasant evening together and started to think seriously about the training which was to follow. The training consisted of sessions for the whole group every morning, and advanced sessions with Sensei for Rick and myself in the afternoons. As usual it was learn more, constant practice of technique and then, “more speed please!” During these sessions we moved ahead and learnt more Bo Kata, Tonfa techniques and kata, and Eeku technique and kata. There were many discussions with, and explanations by Sensei of kata and technique, and Okinawa Kobudo weapons and their history. On the next Saturday Sensei took us to Kume Jima island where one of his students lives and has a dojo, Shihan Yoshinnori Taira. Kume Jima is about a 40 minute flight from Okinawa, has a population of 9,500; three sets of traffic lights, and sugar cane everywhere!! Taira Shihan picked us up at the airport and took us to all the points of interest on the island, and also to the local sake factory where we tried some 18 year old sake…now that was an experience!! That evening we all trained at his dojo and Sensei really stepped up the pace. After training we were treated to an incredible meal of beautifully prepared sushi and salad with the odd beer and sake for good measure. Then it was back to Naha and more training before we departed on November 12. As with our previous trips we found Hokama Sensei to be most helpful and informative, and we thoroughly enjoyed his instruction and company. As a result of this trip I was made Sensei’s first Australian branch chief in Kobudo and was graded to Sandan (3rd Dan) in Kobudo. 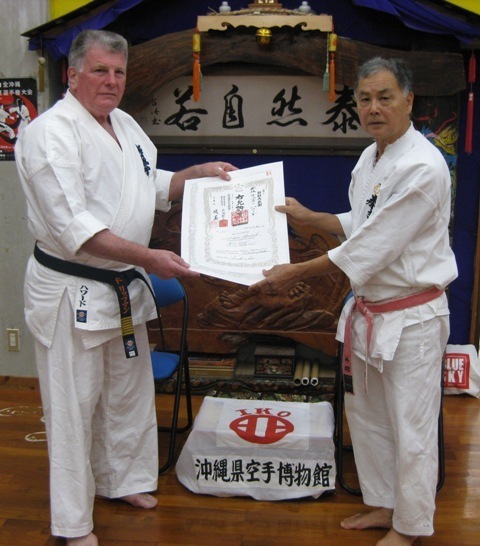 Shihan Cunningham was also graded to 3rd Dan in Kobudo. For us this was a most unexpected end to this trip to Okinawa and one which we considered to be a great honour. Shihan Cunningham and I will continue to travel to Okinawa to further our knowledge under the instruction of Sensei Hokama and look forward to honing their skills in Kobudo.